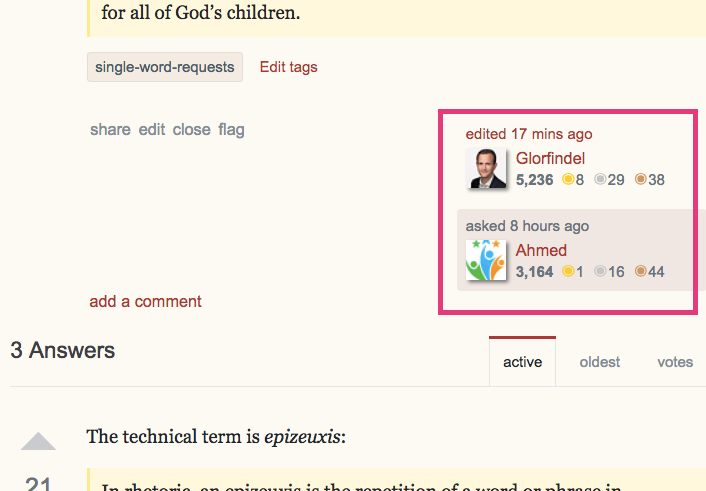 New Layout: Editor _before_ author? Look at any question or answer that has been edited. picture has just one example). The person who most recently edited the question is first, the originator of the question comes second. Also, that second listing is darkened. These too items make the name of the originating author much less noticeable and the latest author very noticeable. This seems very counter-intuitive to me. The primary author of a piece is the one who first submitted it. Edits are expected to be minor and fix typos, add secondary matter, extend content, or otherwise not change the general intent. The original author is the one who set the tone for everything. I'm sure there is a justification for the difference, like 'It was easier to implement with the new changes', or 'Oh, I don't think it matters'. To be clear, it is very counter-intuitive. Is this a feature change in the new layout (i.e. did the new layout change things from the one it replaced)? Is the justification for the change stronger than ... clears throat ... common sense? Which is all to say...can we change this egregious solecism back? Browse other questions tagged feature-request theme-2018 .